Are you looking for an incredible deal on some new production 45 GAP rounds? These 100 round mixed bags are a great way to get you out on the range without breaking the bank. This ammo is available for purchase due to some kind of cosmetic damage on the original packaging. 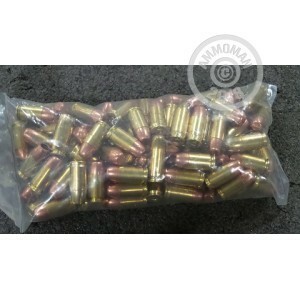 When the outer box is damaged, we kit these rounds into bags of 100 and sell them at a discount! You can expect to see different manufacturers and bullet types in these mixed bags. We separate the rounds by casing type so every round in these bags will be loaded into a boxer primed brass or nickel plated brass casing that can be re-loaded. For this specific caliber you can expect to see FMJs with the possibility of some premium self defense ammo mixed in as well. Quantities are very limited so pick up a couple bags while you can! Don't forget, at AmmoMan.com all orders over $99 will ship for FREE! I bought 3 bags and every round fired perfect. I definitely would have bought more but only 3 were left.nice clean assorted ammo and each bag had a couple of extra rounds. I wish they would have more deals like this again.